Fiberglass-RV-4Sale has had over 6 Million Visits to the site since we began in March of 2009. The targeted buying and selling traffic is so high every day on fiberglass-rv-4sale, that Ads listed here sometimes have sold within the hour. A big thank-you to all of the Molded Fiberglass Enthusiasts who make this site so great!! 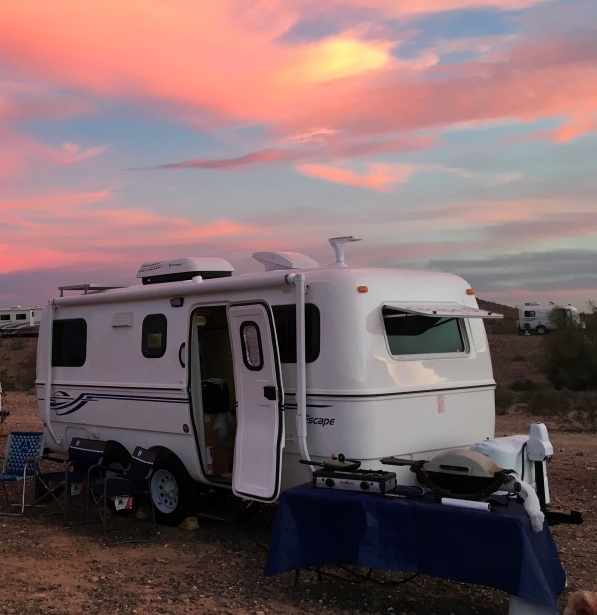 At Fiberglass RV's For Sale, we have a passion to help buyers and sellers connect. Molded Fiberglass RV's, or "eggs" as they are fondly called, have been around for quite some time but are a niche market that not many people know about. When one is spotted on the road or in a campground, they stir up quite a bit of interest. When we first started this website, the listings for Molded Fiberglass Travel Trailers were scattered everywhere and one had to spend hours of research to find a trailer. Many of the trailers were listed on Craigslist but were rife with national Scam Ads that were originating mostly out of Eastern Europe and targeting US buyers of Molded Fiberglass Travel Trailers. To develop top research techniques and provide a single buying and selling website exclusively for Molded Fiberglass Travel Trailers that was highly organized by brands. We wanted a Free venue for sellers to list similar to the other venues, but be as free from Scam Ads as possible. As an aside to this we started our SCAM Alerts years ago to call out the big SCAM operations and listings as we can detect the ads. Not only has this helped to keep Fiberglass-rv-4sale ads clean, but over the years has tremendously reduced the SCAM listings on other venues. We're always here to help you buy or sell a Molded Fiberglass Trailer. There are three main components to selling and buying these gems. Price, condition and location. If you need help with your ad or buying assistance email us at info@fiberglass-rv-4sale.com and we're happy to assist you. We also wanted a to develop a comprehensive SOLD Archive organized by brand for two reasons. Years ago, many sellers had no idea what these trailers were worth so you'd see many sellers taken advantage of and their trailers appearing for resale within days at a much higher price. Now sellers and buyers can both research our SOLD Archives to more accurately determine the valuation for what they are selling or buying. Second, insurance companies were paying claims for these trailers per NADA which has no idea what the correct valuation for these trailers is. We have had countless insurance claims settled at much higher values when the claims agent has been supplied with recent SOLD comps from our database. We're Molded Fiberglass Trailer hobbyists just like you, or soon will be joining our family when you find the right "egg." We love the hobby, the trailers and have enjoyed watching it grow in popularity over the last decade. We also own and manage Scamp Owners International, one of the oldest owners clubs in the hobby. We hope to see you out there soon!